Manchester United may be interested in a move for former AC Milan striker Alexandre Pato, claim Talksport. 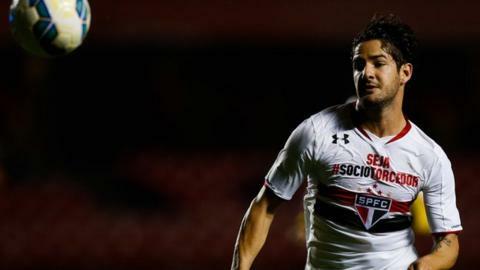 Now at Brazilian club Corinthians - but on loan at Sao Paulo - Pato said: "Next year I won't be playing at Sao Paulo, everybody knows that. I hope England or Spain." The Daily Express report that Louis van Gaal has defended summer signing Memphis Depay, who has been dropped from the Netherlands team amid comments from coach Danny Blind about the winger's inability to function in a team. "I have said he is the greatest talent of his age but he is only 21 and you cannot expect consistency," Van Gaal explained. Writing in the Daily Telegraph, Harry Redknapp suggests no one playing in the current Man United line-up would make it into a Sir Alex Ferguson team. "Without being disrespectful, I do not think any of the current United players would get into those Ferguson teams and that should tell you everything about what Van Gaal is working with now," says Redknapp. The Independent take an in-depth look at Wayne Rooney's form and claim that it shows "how poor" the United skipper has been this season. "Rooney is taking fewer shots per game than at any time since the beginning of the 12-13 season and of those shots he is converting fewer chances, less than 10% in fact," says the paper. Given his current struggles, the last thing Rooney needs - reports the Daily Star - is a jokey tweet from Greater Manchester Police, which read: "Missing Person-Wayne Rooney last seen in the Trafford area wearing a red shirt , any sightings please inform colleagues". The tweet was later deleted. On a happier note, the Liverpool Echo tells us that Rooney and his wife Coleen have been celebrating the sixth birthday of their son Kai and as a present bought him... cardboard cut-outs of himself. No really.